INUREDs extensive network of partners in Haiti and abroad is testament to the exchange and circulation of knowledge. And while the institute has focused much of its efforts on bringing knowledge from outside of Haiti to reinforce the talent that exists locally this year we have evolved in how we think about developing the capacity of Haiti’s future intellectuals. In order for young researchers to participate fully in academia their participation must go beyond their geographic borders. Thus, it is imperative that local Haitians represent Haiti internationally as their first-hand experiences with recovery, rebuilding and development can make an invaluable contribution to regional and global dialogues. Consequently, this year INURED made a commitment to send a delegation of seven of our Research Assistants to Gosier, Guadeloupe to participate in the 2012 Caribbean Studies Association annual conference titled, Unpacking Caribbean Citizenships(s): Rights, Participation and Belonging. Their participation gave them an opportunity to share their experiences conducting scientific research in Haiti while providing an opportunity for them to meet and dialogue with an international network of existing and emerging Caribbean scholars. The Research Assistants presented two panels. 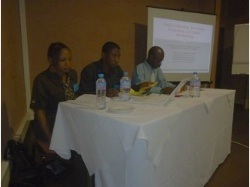 The first panel titled: Higher Education, Knowledge Production and Nation (Re)Building, explored the appropriation of space and in the Haitian context, how it fosters and/or prevents violence as well as its impact on the implementation on the of the Violence Against Children national study by INURED. The second panel titled, Developing an Active Citizenry in Haiti through Higher Education, Civic Participation and Community Engagement, explored scientific research in Haiti, its evolution and INURED’s vision to transform Haitians from passive to active participants in the research endeavor. INURED would like to formally thank the Haiti Illumination Project, the Caribbean Studies Association, and INURED’s Board of Trustees for their financial support of this capacity building initiative. We would also like to express our sincerest gratitude to the Ambassador of France, his Excellency Mr. Didier Le Bret, and the Ambassador of Spain, his Excellency Mr. Manuel Hernández Ruigómez, for their support in making this extraordinary endeavor come to fruition.